In this fast paced world, it is good to see that some things remain the same. 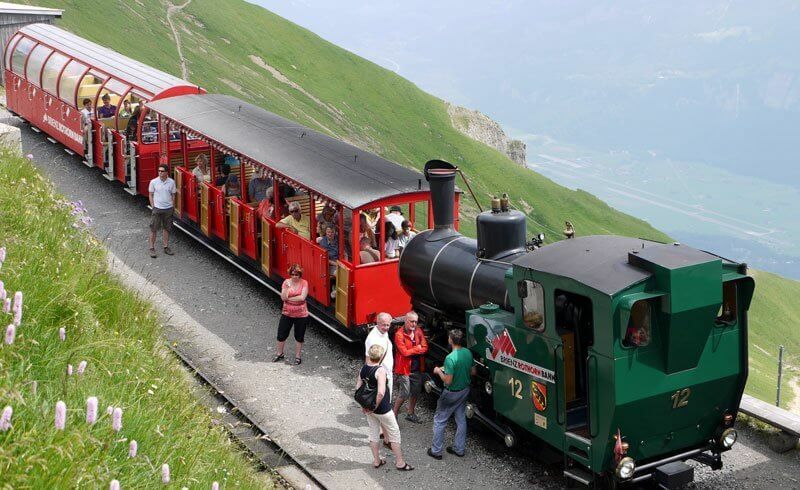 The Brienzer Rothorn steam cog railway is one of these things that has withheld the constant cycle of change. My memories from a father-son trip in the 1980's were confirmed the moment we arrived at the nostalgic train station in Brienz! Nothing had changed in the years since: The charming ticket office and the conductor who manually validates each ticket. The classic rail cars with open air panoramic views and the deafening sound of the steam engine. And just like back then, the tradition of waving at other rail cars and hikers along the way remained! Along a track of just 7.6 km, the Brienzer Rothorn steam cog engine pushes the passenger coaches to an altitude of 2244 m above sea. That's a change in altitude of no less than 1678 m! Once at the top, we highly recommend climbing the last few meters to Rothorn Kulm. The views from up there were simply breathtaking! As luck would have it, we spotted our first ever family of capricorns! Three Alpine mountain goats were grazing just a stone's throw away, while another one was carefully crossing a snow field! It was quite an experience to watch these capricorns in their habitat!